This is the sixth installment in our seven-part The Modern Pro series, in which GOLF.com is breaking down what it means to be an elite professional golfer in 2018. In previous editions, we broke down players' swings, bodies, brands, lives and money. This week we examine their domain. ----------------------------------- One night in April 2016, a group of pro golfers took to Jupiter Lanes bowling alley during a tournament off-week. The group was six or eight deep, and talented: a couple had status on the Web.com tour, while several others played PGA Tour Canada or PGA Tour Latin America. And yet they weren't even the most talented crew of golfers on the premises. That's because Justin Thomas, Jordan Spieth, Rickie Fowler and Smylie Kaufman were just a few lanes away. The star-studded foursome would embark the next day on a spring break trip to the Bahamas, the fabled #SB2K16 bacchanalia that burned through golf's social media channels and has come to define a new generation of chummy pros. But on this night, they were throwing strikes, spares and a few gutter balls, and nobody in attendance seemed to take much notice. "That was kind of cool," said one pro from the first group, who asked not to be identified. "But it wasn't, like, weird. That's what happens here. The only time I actually realize how strange a place Jupiter is is when I go somewhere else. "Or when I remember that guys from the last generation — Vijay, Tiger, Ernie — those guys didn't all hang out together." The current crop of Tour players has increasingly become clustered together. Just five communities are home to more than half of the 228 Tour pros living stateside. They've flocked to Florida and Texas, favoring states with warm weather and without income tax and settling in affluent suburbs such as those outside of Dallas or golf-friendly towns like Sea Island, Ga. and Ponte Vedra Beach, Fla. that allow access to private clubs and games with other pros. Even in that context, nowhere in the golf world is quite like Jupiter, Fla. The Palm Beach County enclave is home to just 60,000 people, but without going more than 10 miles up and down the coast you can get to the home of the world's No. 1 golfer (Dustin Johnson), the reigning player of the year (Justin Thomas), the U.S. Open champion (Brooks Koepka) and the greatest player of all time (take your pick: Tiger Woods and Jack Nicklaus are both in residence). Officially, 35 PGA Tour pros live there, but between rentals and second (or third, or fourth) homes, the true number is certainly higher. Ryder Cuppers abound, including Rory McIlroy and Rickie Fowler. So, too, do Hall of Famers: Greg Norman, Gary Player, Ernie Els, Nick Price. And the world's most famous golfer — President Donald J. Trump — spends his winter weekends on fairways that bear his name in Jupiter and about 15 miles south in West Palm Beach. Curiously, it may have been Elin Nordegren who shifted golf's geographic balance. Which town can claim bragging rights as the pro game's "capital" is a decades-old debate dating back to the winter haunts favored by Arnold Palmer (Orlando) versus Nicklaus (Jupiter). But when Woods bought Jupiter property in 2006, it was partly at Elin's request to spend more time with her Swedish friends, including Jesper and Mia Parnevik. As a result, Woods's migration south from the swanky Isleworth community in Orlando signaled that golf's official hot spot was on the move (Woods and Nordegren had split by the time they actually made the move to Jupiter, in 2011). "In Orlando, there's a bunch of lakes, but it's not the ocean," Woods said at the time. His new $54 million compound sat on 12 oceanfront acres complete with tee boxes, bunkers and four varied-grass greens. "Jupiter is just a great area to live." It's safe to say Woods's brand has traveled to Jupiter, too. A recent trip to his upscale sports bar, The Woods, found a staff of muscly bartenders and svelte servers wearing Nike TW apparel (and white belts). Restaurant receipts came attached to scorecards of Woods's Houston course, Bluejack National. Woods's girlfriend Erica Herman, general manager of the restaurant, quarterbacked the staff in a black baseball cap and managed the balance of golf highlights and NBA games on the panel of flatscreens mounted above the bar. The Woods is a popular hang for Tiger's pals: Fowler celebrated there after his 2017 Honda Classic win, and Justin Thomas took to The Woods in the wake of last year's PGA Championship, his first major win. The camaraderie makes it hard to remember the days when Woods thrived on rivalries — at this point, most of his potential arch nemeses have dined at his restaurant or played in his tournament. He's older now, but more a part of the crew than ever. https://instagram.com/p/BcgLqrkgmoR/ "It's very rare that when you go out to dinner and don’t run into somebody," Keegan Bradley told GOLF.com last summer. "If you go to the Woods, you're gonna run into JT, you're gonna run into Kevin Tway, and it's fun. You'd think it would be a little annoying because we're with each other all the time, but it's actually great." Bradley was an early member of the Jupiter crew, moving there in 2010 with high school teammate (and fellow pro) Jon Curran. Fowler came that same year, and Woods arrived months later, just before Johnson. McIlroy moved in a year later, joining a growing group of the game's elite whose talent was concentrated at two clubs: Medalist Golf Club, started by Norman, and Nicklaus's Bear’s Club. Medalist, in Hobe Sound, became Tiger's domain. Fowler, DJ, and Thomas also play there. If the club name rings familiar that may be because Medalist is often referenced whenever Woods is in the midst of a comeback: his course record 62 in 2011, his famous "worst-ball 66" leading up to the 2015 Masters, and rumors that he was hitting it "way by" Fowler in the lead-up to the 2017 Hero World Challenge (confirmed by Fowler himself). But Woods's friendliness with the game's younger stars has been telling, particularly in the way he embraced his role as assistant captain at the Presidents Cup this fall. While he'll often practice by himself — "Nobody asks to play with me," he joked recently — some days find him in marathon range sessions with pros like Fowler or Johnson, golf's modern titans trading swing thoughts under the South Florida sun. Fifteen miles south, back in Jupiter, is the Bear's Club which, headlined by McIlroy, is the only club that can rival Medalist in star-studded membership. In contrast to the Medalist members, whom Fowler has said are there to play golf, not "mess around," Bear's Club is far more social, in part because many of its members live on property. Several players, like Thomas, hold dual membership at both courses. Another dual member is a Godfather figure in Jupiter golf: Michael Jordan. "He unequivocally loves the game more than anyone else I’ve ever met," Bradley said. The NBA legend hosts regular money games with anyone from businessman hackers to U.S. presidents to the game's very best players. His desire to play by his own rules — as fast as he wants, in as large a group as he wants, without talking to anyone else in the locker room — have spurred him to hosting games at the Floridian in nearby Palm City. (Need more star power? Presidents George W. Bush and Barack Obama recently joined the Floridian, too.) More to the point, MJ has begun construction on his own club, Grove XXIII, that promises to be a no-holds-barred retreat for the NBA star and his friends. https://instagram.com/p/0yvC6sRWeL/ Grove XXIII could prove to be a lucrative stop for Tour players, too: Regular playing partner Keegan Bradley has jokingly called Jordan a "human ATM," and despite saying "he'll play my buddies for 10 bucks," witnesses to the groups have said that tens of thousands of dollars can change hands in these games, too. If it seems particularly collegial, well, that's sort of the appeal. "It's cool to be a part of," Fowler said. "I don't necessarily see it as strange and different because in high school I had a really good team and was able to play and practice with my buddies. College I had a really good team and was able to play and practice with my buddies, we were able to push each other. And then being here, being with guys like JT, who lives right down the street, to Tiger, Rory, Ernie, Luke [Donald], the list goes on." Real estate isn't exactly cheap in these zip codes. Greg Norman offered up his estate for $65 million several years ago. Rickie Fowler's Jupiter home cost him $14 million in 2016. Rory McIlroy reportedly bought Ernie Els' old house for $12.9 million in January. Dustin Johnson is upgrading, selling his $5 million waterfront home for one that's much larger. But there are enough good players with enough good money that they happily move in and pay dues not just at Medalist and Bear's Club but at a sizable next tier of clubs, too. Places like Dye Preserve, MacArthur, and Old Palm, which each boast a handful of established Tour players (Old Palm's roster includes not just Els but major-winners like Louis Oosthuizen and Charl Schwartzel), and countless players on the cusp of the Tour are ever eager to join. 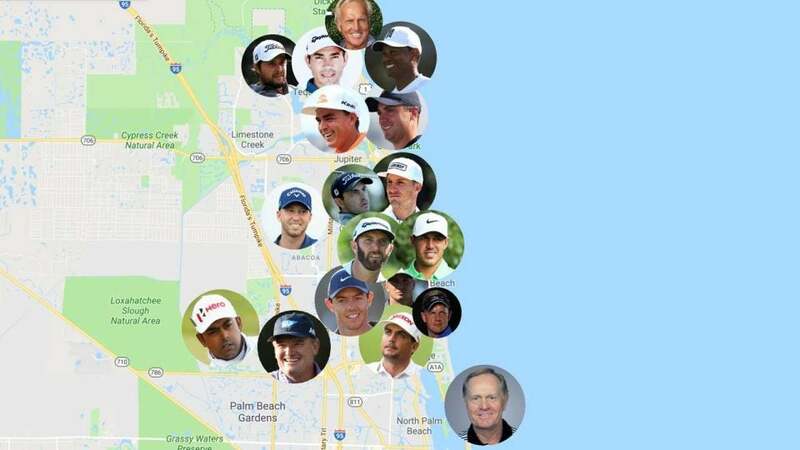 But it's not just golf's richest and best who move to the area seeking the good life: The mini-tour underbelly of the sport has major roots in Jupiter, too. Members at many of the private clubs would do well to avoid playing matches against their caddies, who are often aspiring pros themselves. "Guys have it rough with the adjustment to West Palm sometimes," one head pro said. "It's disorienting when your bartender can shoot 69 without breaking a sweat." The iron-sharpens-iron mentality draws the lower levels to town, mini-tour pros hoping that playing near (and occasionally with) the best will test and elevate their games. Daniel Berger can attest: He grew up working at the Dye Preserve and eventually talked his way into money games with pros at the club, which he has said got his game to the next level. One robust mini-tour, the Minor League Golf Tour, is based in West Palm Beach, where it often takes rounds in the low 60s to claim first-place checks that are three digits shy of what Tour pros play for. That's the other side of the multi-millionaire coin: games are damn competitive here. The Honda Classic pre-qualifier — that's the qualifier to get into the Monday qualifier — attracted over 300 entrants in 2017, nearly maxing out three different sites. In all, though, players like the area because it's comfortable. They find peace among fellow members, who maintain a nonplussed air around the Tour stars. And for all the trappings, pros' lives in Jupiter trend toward the low-key. "This isn't Miami," the pro from the bowling alley told me. "A night out isn't going to be all night at the club. Just as often it's going to be beers at a spot like [tiki bar] Square Grouper. Hell, even Jumby Bay," a colorful drinking hole that serves $3 Tito's and dollar drafts. "It's a small world. Guys are going to the same restaurants, living in the same neighborhoods. It's a bubble, for sure. But it's a beach life, a casual life." In the end, if "Jup life" means fishing, beaches and beer, it's the Tour's closest thing to a country song. It's simplicity and contentedness for those who have plenty. The current, former and aspiring Tour pros settled in northern Palm Beach County have made it so.